muicache! as already mentioned in the project presentation post, is composed of two basic components/scripts: "Client" and "Server". 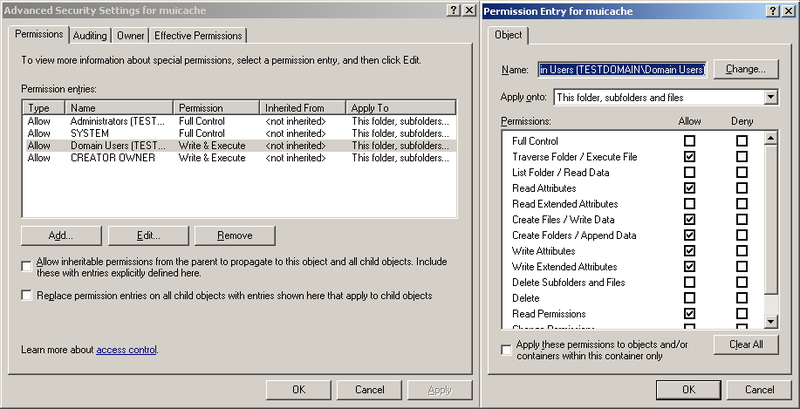 The "Client" has to be executed by every network user during the login phase and it is going to collect a series of information which are based on the contents of the registry key "HKEY_CURRENT_USER\Software\Microsoft\Windows\ShellNoRoam\MUICache"; the collected informations will be stored in XML format in a shared folder of any network server. In that way, the component "Server" will be able to elaborate them aiming to populate a database and create an XLS report. 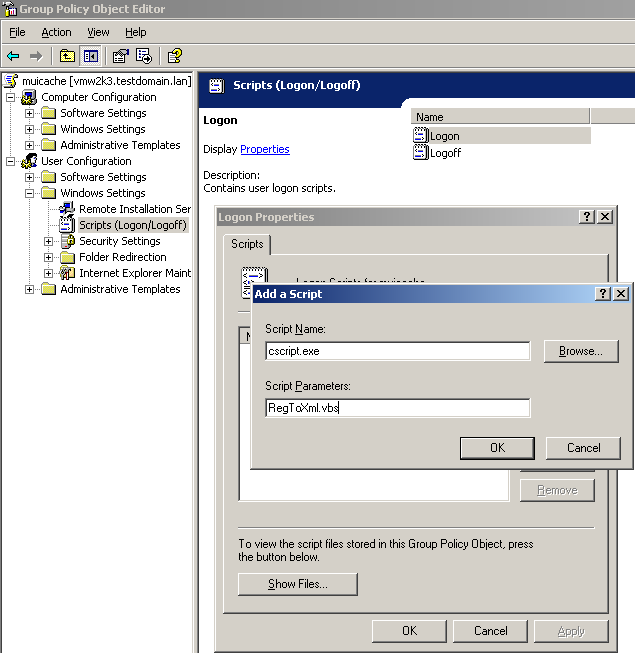 As you can see, the process is very simple and for the implementation it's sufficient having a simple Logon Script Policy and a shared folder. 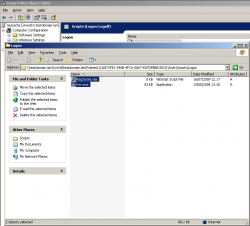 Download the archives muicache.zip which contain all the toolkit's files. Download the Microsoft utility fciv.exe which cannot be included in the above mentioned package because of the copyright, this is the link for the direct download. In reality it would be enough to assign the "Modify" permission to the "Domain Users" group but doing so you will not be able to guarantee the security/privacy of the database and its files. This setup will stop the "Domain Users" from snooping around in the toolkit's files and folders. 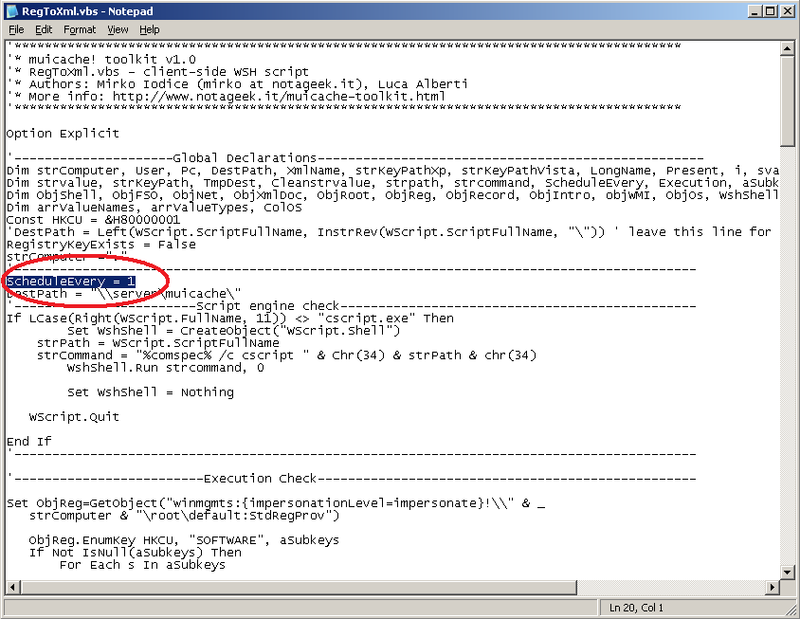 CollectData&XLSOutput.vbs is the "Server" script which imports the files within the database muicache.mdb and exports them creating an XLS report. exclusions.txt is a text file which will be used by CollectData&XLSOutput.vbs for filtering the XLS report; further details in the next section of the article. 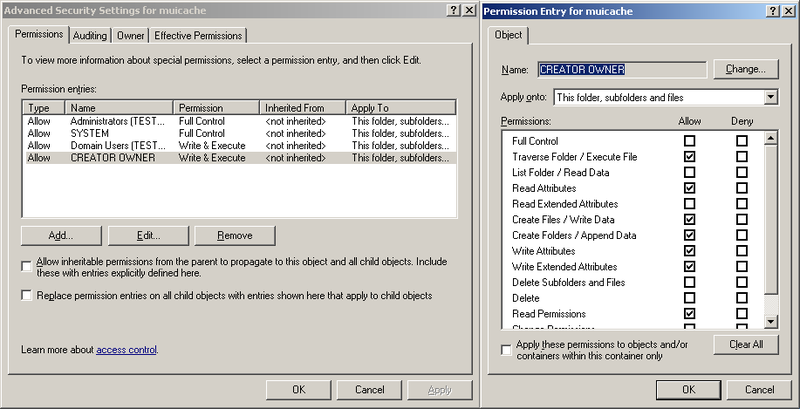 Extract RegToXml.vbs in a temporary folder and open it with a text editor. For the correct use of this script you have to modify the variable "DestPath" which is at line 21. Its value has to be equal to the UNC path of the shared folder you created before. If you consider it necessary you can also modify the variable "ScheduleEvery" which you can find at line 20. Its value represents the minimum number of days before the script collects new data. The pre-defined value "1" means that RegToXml.vbs will be executed maximum once a day, and as for the value "7" which means that the execution is made once a week. Setting the value to "0" instead enable the execution of the script every time a user logs in, this can happen several times during a day. Once done the required modifications, save and close the text editor. Now you are able to go on with the Logon Script Policy setup which is necessary to lead the execution of RegToXml.vbs for every user. 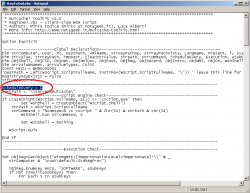 Together with it you have to distribute the fciv.exe which is necessary for calculating the hash. 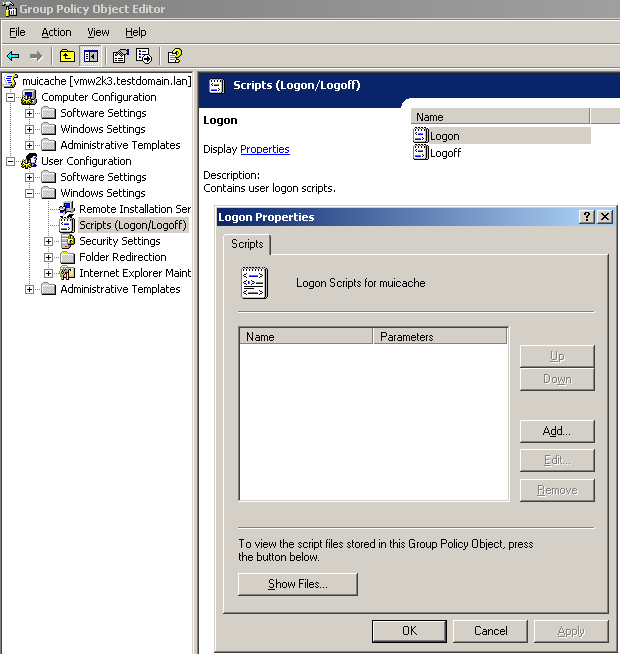 Create a new Group Policy object and link it to an organizational unit or, if you prefer, to the whole domain. 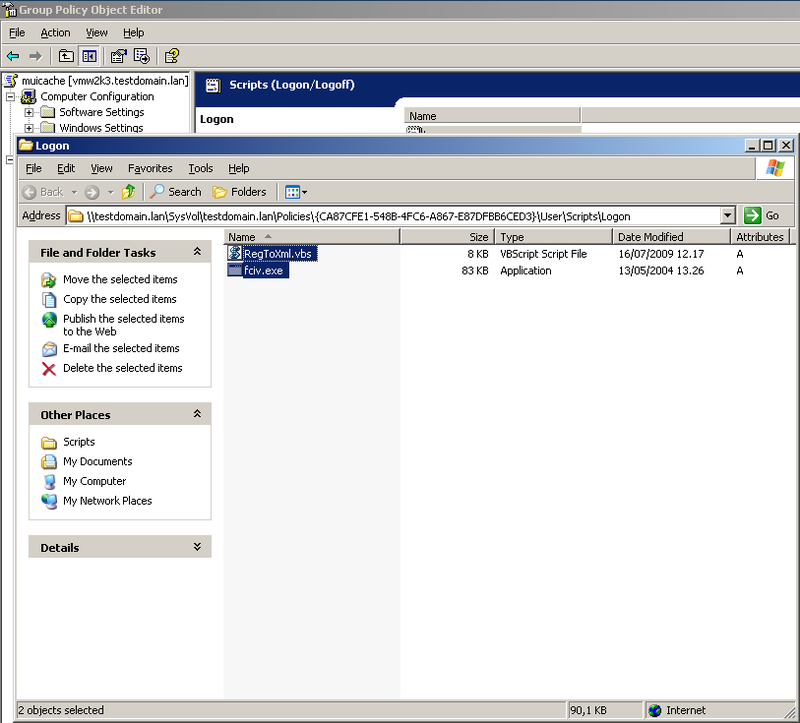 Select "Show files"... and a window will be opened showing the content of an empty folder. 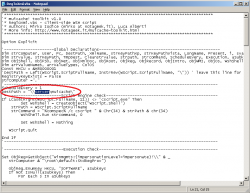 Copy the files fciv.exe and RegToXml.vbs in it. Close the window and select "Add". A new dialogue window will be opened, it is required to specify two values: "Script Name" and "Script Parameter". 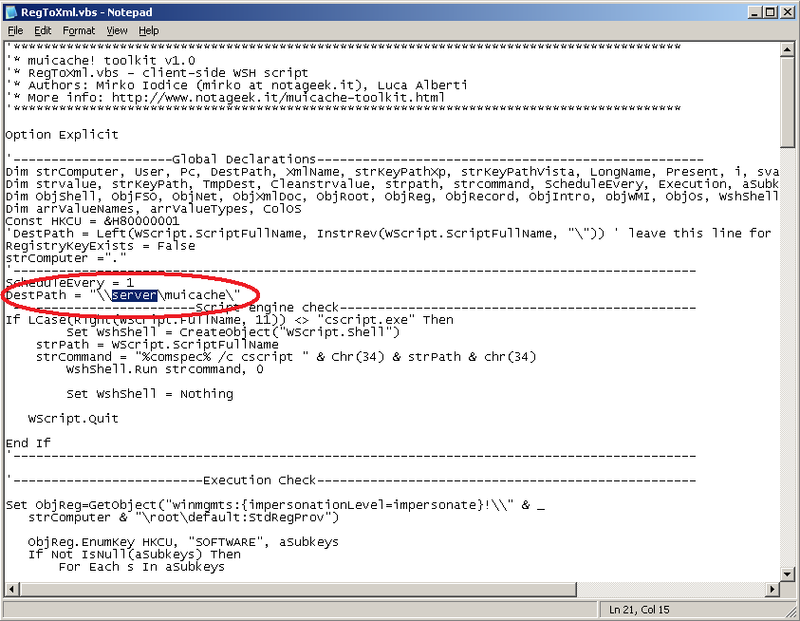 Set the first one equal to "cscript.exe" and the second one to "RegToXml.vbs". Select "OK" and close all the open windows. muichache! is now installed and it will collect all data starting with the next user's login. 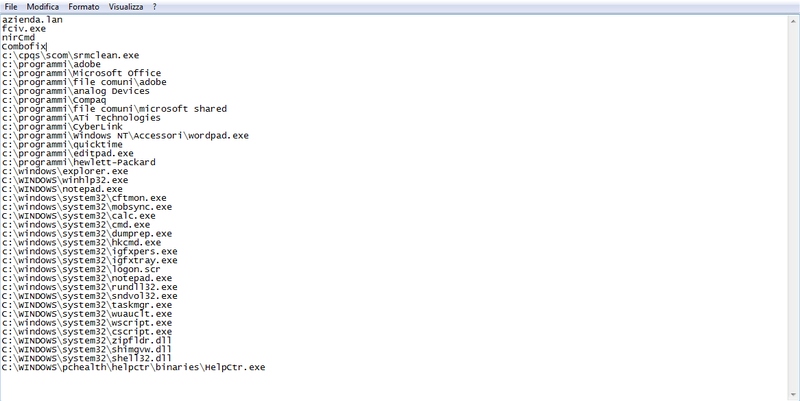 The collected data will appear in the shared folder as XML files. In specific, it is going to be created a file for every user/PC combination. Using the command line "cscript.exe" you will see several messages reporting the status of the execution. Using "wscript.exe" instead you won't get any feedback and you will have to wait until the process ends. On the 64 bit systems it is necessary to use the WSH engines ("cscript.exe" and "wscript.exe") located in the folder "C:\Windows\SysWOW64" instead of those predefined located in "C:\Windows\System32". You might also take in consideration the possibility of executing it on regular intervals by a scheduled task. The database will be filled using an incremental approach so there will be no risk of creating double records. Finally, after having imported the files, a report in XLS format (muichache.xls) will be generated, it can be opened using Microsoft Office or OpenOffice.org Calc. You will find an example in the videos posted in the project presentation post. 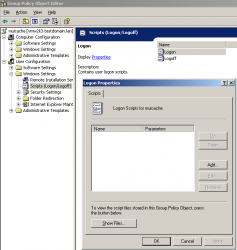 Every line (record) of the report is composed by a series of information (fields) which refer to a file tracked by the "HKEY_CURRENT_USER\Software\Microsoft\Windows\ShellNoRoam\MUICache" registry key of a determined user logged on a determined computer. computer, name of the computer on which the file was executed. It's important to note that a filtered record is not removed from the database. A filtered record is simply excluded from the report view and can be reintegrated whenever you want, you just have to remove from the "exclusion.txt" file all the words corresponding to it.